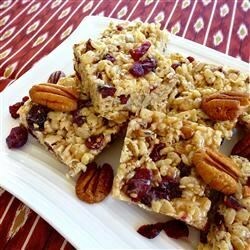 "This is a power version of traditional crispy rice treats made with different nuts, coconut and cranberries." In a large skillet over medium heat, stir together the sesame seeds, sunflower seeds, pecans and almonds. Cook until the sesame seeds are starting to turn golden, about 3 minutes. Add coconut, and stir until sesame seeds are golden. Watch carefully, as they burn easily. Stir in the cranberries and cereal, and remove from heat. In a large saucepan, combine the peanut butter, butter and marshmallows. Cook and stir over low heat until marshmallows are melted. Pour in the cereal and nut mixture, and stir until evenly coated. Press lightly into a greased 9x13 inch baking dish. Let stand until cool, then cut into bars. Store in an airtight container, or wrap individually in plastic wrap. These were great! It's a pretty foolproof recipe. I subbed in extra and different types of seeds and nuts and it was awesome. Thanks for the recipe. These were soooo---good. I made them for Christmas. The only change made was that I used no sesame seeds and double the sunflower seed. SOOOO good. These are just like the fruit cereal bars at Second Cup. Thanks for Sharing!!! OMG! I absolutely loved this recipe! I seriously recommend trying this out! So yummy! A rice-krispie squares for adults. I love the dried cranberries in this. I used vanilla rice krispies.